FAYETTEVILLE, Ark — The Razorbacks took advantage of five extra-base hits in the second and third inning on Tuesday (April 16), scoring nine runs off two home runs and three doubles to take the mid-week contest from UAPB, 10-0 in five-innings. Sophomore Hannah McEwen and senior Haydi Bugarin would be the two Hogs to go long in Arkansas’ ninth run-rule victory of the season. McEwen reached base safely in all three trips to the plate. As a 46-game starter in the leadoff position, McEwen has extended her on-base streak to eight games, finding a way to the bag in 42 of 46 games this season. 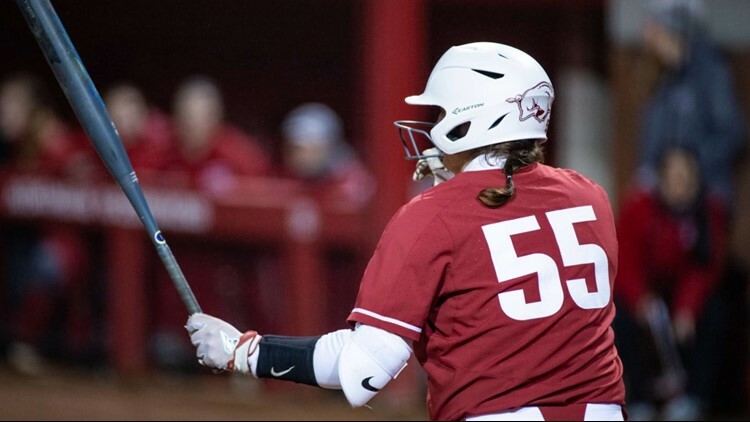 She was the first to score for the Hogs, scoring in the first inning after reaching on a Lady Lion error and crossing the plate ff the bat of senior Katie Warrick, who singled up the middle for Arkansas’ first of ten hits. Arkansas scored four more runs in the second to take a 5-0 lead over UAPB. Juniors Sydney Parr and Keely Edward both contributed hits in the home-half of the inning, scoring with help from Bugarin’s home run and a double by McEwen. The Razorbacks held steady at the plate in the third, as sophomore Kayla Green used a leadoff walk and a single by Parr to reach second. The Hogs called on Carley Haizlip to pinch run and she scored for Arkansas on the next hit by Bugarin, a double to left field. Nicole Duncan connected on the 0-2 count and singled to the left side to score Parr. Bugarin would score on a sacrifice fly by Edwards and the Razorbacks took an eight-run lead in the third inning. The final two runs of the night came from McEwen’s home run in right center, only her second of the season, but good for her 54th hit of the year, a team best. Arkansas looked to juniors Autumn Storms and Lauren Graves for support in the circle today, as the duo combined for the shutout, recording six strikeouts against the Lady Lions. The Razorbacks close out on their homestand with a three-game conference series against No.9 LSU starting on Thursday (April 18) at 6 p.m. (CT). The Hogs and Tigers will play Friday at 6 p.m. (CT) and on Saturday for the series finale at 1 p.m. (CT).